David Weber, Oct. 16, 2018, 9:09 a.m. The late hanbok designer Lee Young-hee has been decorated with a posthumous cultural honor. Lee died of pneumonia in May at the age of 82. 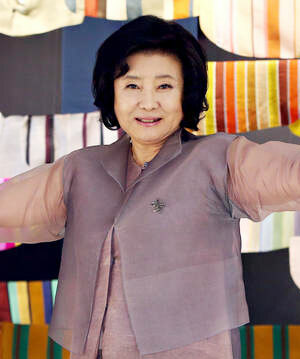 The Ministry of Culture, Sports and Tourism on Monday awarded Lee the Geumgwan medal, the nation's highest order of cultural merit, for her contribution to modernizing and promoting hanbok or traditional Korean dress, overseas for more than four decades. The medal was presented to her daughter, fashion designer Lee Jung-woo, at the opening ceremony of the annual hanbok fashion week event in Jeonju, North Jeolla Province on Monday.